TWO CORNISH STATIONS COMBINE FOR A JOINT VISIT. 5th April 2017. 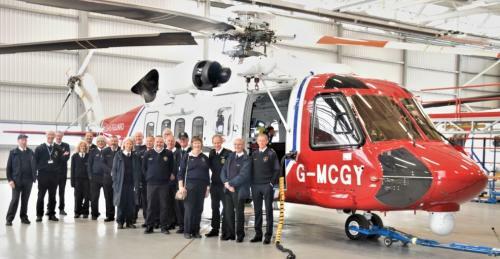 The National Coastwatch Stations at St Ives and Cape Cornwall got together to make a joint visit to Bristows Maritime & Coastguard Agency Search and Rescue base at Newquay airport. The team at Bristows were very welcoming and clearly explained how they operate. This was followed by an informative tour of the base and helicopter. The visit, arranged by St. Ives Station Manager Helen Simpson, was both informative and a good way of station members getting to know each other. The group was made up of twelve members from the St Ives station and seven from the station at Cape Cornwall.